In last weeks blog we visited a fabulous off-the-beaten-path, seldom-visited church in Albogasio, Italy. 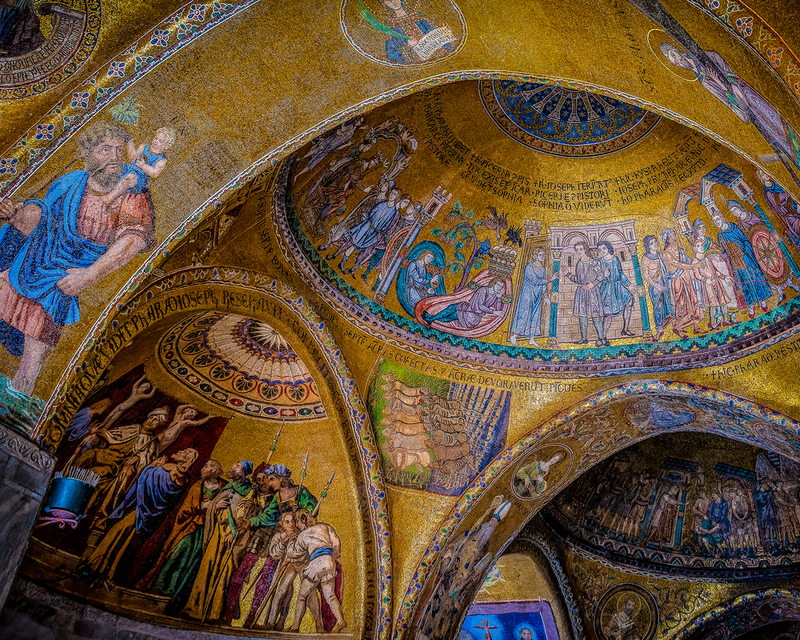 With its clean lines and beautiful painted art works, it couldn't be more dissimilar to the church I will show you today -- the Basilica San Marco. 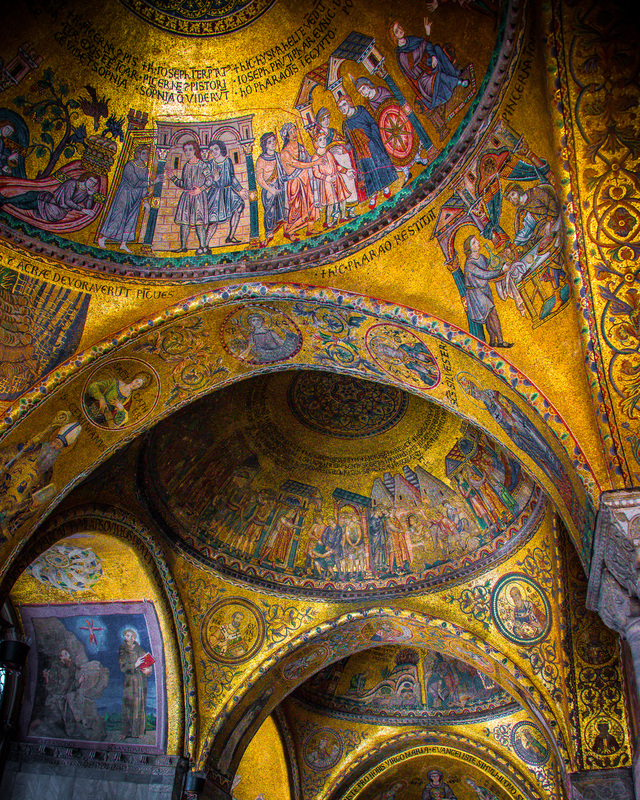 San Marco is the antithesis of that little Albogasio church in so many ways. 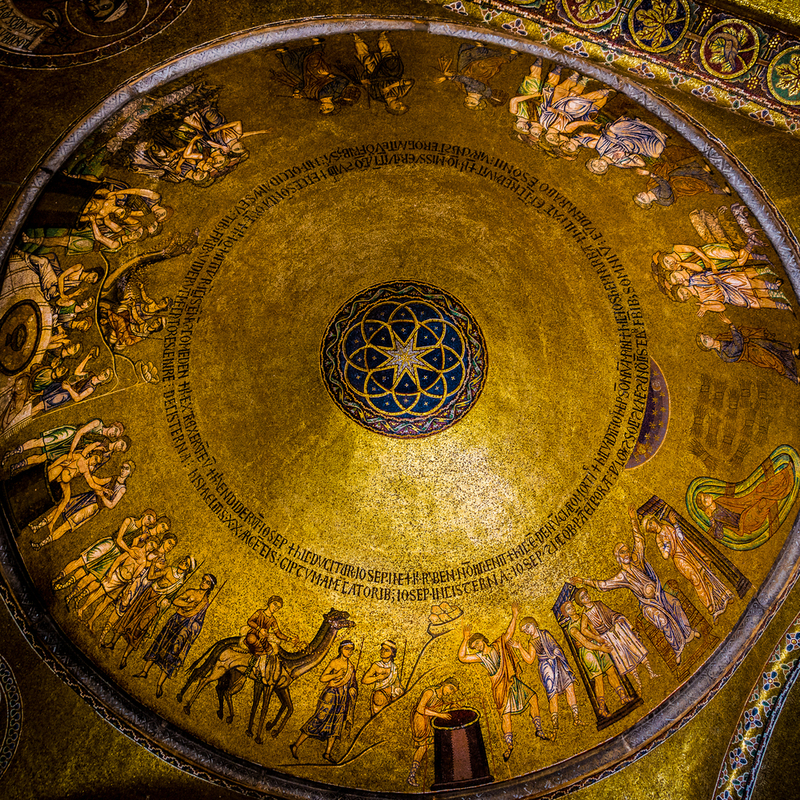 One way is that the Basilica sits right-smack-dab in Piazza San Marco in Venice and has hundreds-of-thousands of visitors each year. This photo which shows the exterior was taken in January, 2004, on a cold and dreary day. Notice the exterior embellishments, like these protected saints enclosed in their spires, visible in this more recent photo. The other significant difference between this church and others? It's that the...well, I'll tell you the difference below in a bit...see if you can tell before you get there! This church's embellishments date from the 11th century. 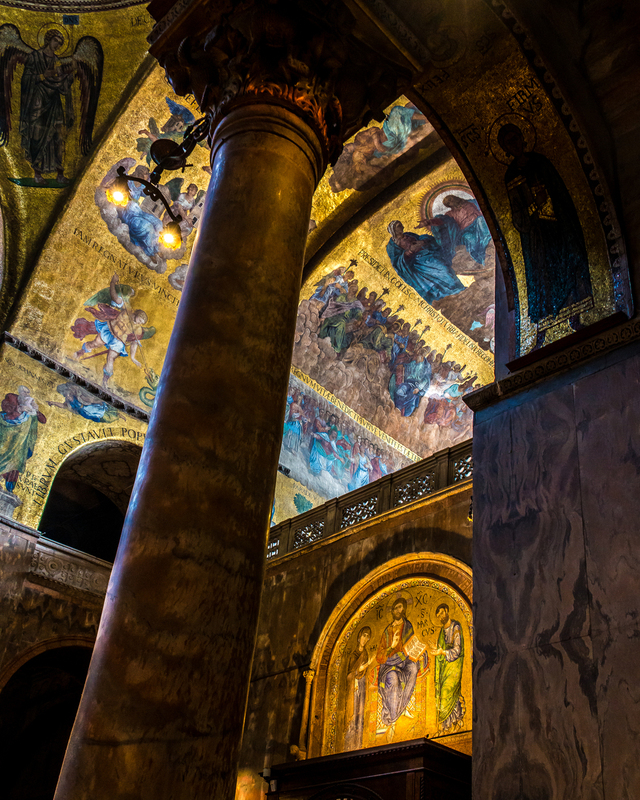 In the crypt you will find the bones of Venice's patron saint, St Mark, whose body was whisked away from the Muslim authorities in a daring raid in Alexandria, Egypt in the year 828. 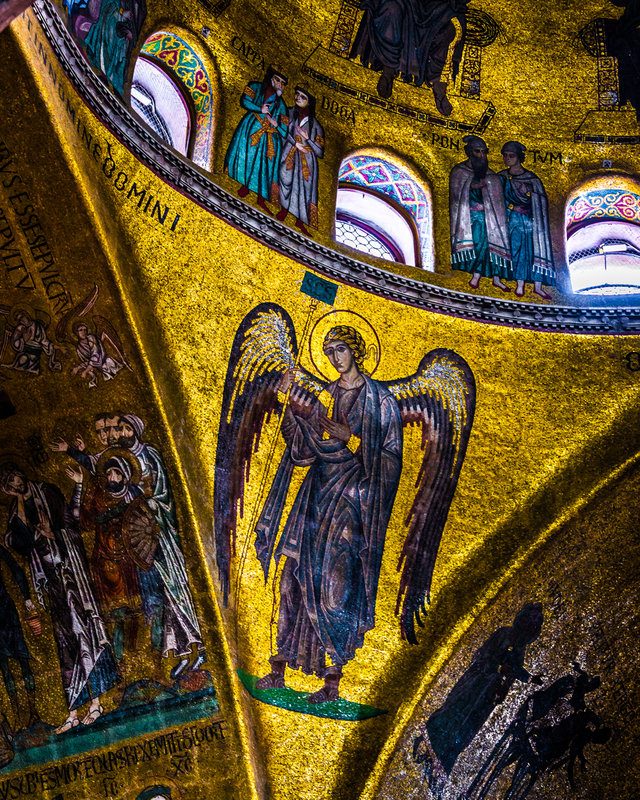 Before you even enter the church, you are treated to magnificent Biblical scenes like this one above the entrance to the church. In the portico before entering the church, you can see art works depicting Old and New Testament Biblical stories, one of which includes, among other stories, the Genesis story of Adam and Eve in the Garden of Eden. Can you identify any of the other Biblical stories? We are now inside the church. This photo from the left transept shows a bit of the art work and the scale of the church, which was originally designated as the Doge's private chapel. The Doge was the elected leader of Venice -- no monarchy in Venice! Here you can see the Pala d'Oro, which is gold altar screen embellished with precious jewels. Can't see the jewels? Here is a more detailed view. Another interior photo showing religious scenes. Have you figured out what makes this church so unique? Ready for the big reveal that I promised earlier? Every art work -- inside and out -- that you've seen in the photos above is composed of mosaics, like these. That's about 90,000 square feet of colorful mosaic tiles. Here you can see just how colorful these mosaic art works are as Samson and David take a bit of time to sit and talk about their trials and tribulations. Here is another masterpiece with some rather rough-looking angels meting out justice. Not convinced that all you see is mosaic? Here is a detailed view of the photo above. I was fortunate to capture the morning sun streaming through upper windows for this award-winning photo. Is this is still a functioning church? It sure is. Below you see prayer candles and a liturgical chant awaiting the Bishop of this Archdiocese. I'll close with more interior photos from this gorgeous church. Remember that you can click on a photo to see a larger view. So, now you have seen two very distinctly different churches of Italy. 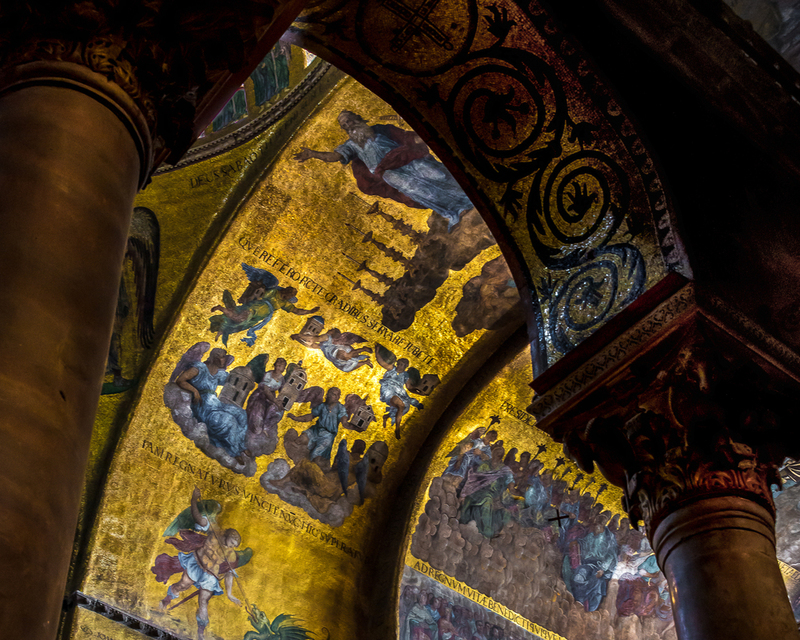 The simple, yet elegantly refined church at Albogasio and the more famous Basilica San Marco of Venice. Both are testaments to the faithful artisans who embellished them as a way to glorify their Lord and Saviour. p.s. feel free to leave a comment in the box below.